A key part of resolving the Syrian conflict lies in establishing a more coherent military-diplomatic dynamic and in post-conflict planning, and the solution is heavily dependent on perceptions. 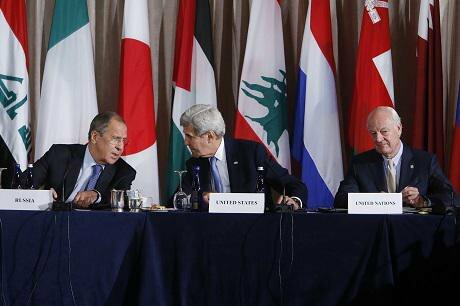 Russia's Foreign Minister Sergey Lavrov, left, and United States Secretary of State John Kerry and United Nations Special Envoy for Syria Staffan de Mistura.Sept. 22, 2016. Jason DeCrow/Press Association Images. All rights reserved. The next US president is going to be in the unenviable position of having to make some difficult decisions in trying to effect positive change in the Middle East. Nowhere is this more apparent than in Syria. A century after the Sykes - Picot agreement established British and French spheres of influence across the Levant, a new division within nation states along religious, sectarian and ethnic lines could be far more detrimental to the long term stability of a weakened regional system and could ultimately lead to the Balkanisation of the Middle East. The ongoing instability and conflict in Syria is generally linked to President Assad's abandoned promise for meaningful political and economic reforms in the 2000s, the popular protests of the Arab Spring, and the security clamp down which followed. However, it is also a legacy of policy failures from the previous two US administrations. Namely, the G. W. Bush administration's decision to invade Iraq which led to a combination of ungoverned and insecure space in parts of the country in which sectarianism was employed by various actors as a mobilizing force, including by the self-styled Islamic State (ISIS). This vacuum has only recently been filled by more effective US - Iraqi military cooperation. In addition, the Obama administration's decision not to take a more robust position on Syria received sharp criticism from state department officials in June 2016 and arguably facilitated Russian involvement in the conflict. The US military could have carried out punitive actions against the Assad regime, such as grounding the Syrian Air Force in response to its use of indiscriminate barrel bombs as discussed by General Patreus in October 2016. Syria will remain a priority because the deteriorating situation on the ground, in places such as Aleppo, coupled with growing tensions with Russia, are increasing the potential costs from fallout associated with the conflict. A key part of resolving the Syrian conflict lies in establishing a more coherent military - diplomatic dynamic, in which military objectives consistently reinforce diplomatic ones to ensure that any future Geneva conference does not fail. It also lies in post-conflict planning whereby a sustainable political solution is found and implemented. That solution is heavily dependent on perceptions. Some analysts have already concluded that Syria no longer exists, and comments by Staffan de Mistura, the UN special envoy for Syria, that Eastern Aleppo could be totally destroyed before 2017 have given credence to this view. It might force a rethink about a devolved solution, something which Russia's Deputy Foreign Minister, Sergei Ryabkov, suggested was possible during the ceasefire in February 2016. This may sound more realistic, but it would likely facilitate disintegration of the state. No matter how important it may be for the Syrian opposition forces and some states to push for the removal of President Assad from office and for a transition to take place, so long as there is Russian and Iranian support for President Assad's regime, all other factors being equal, it is likely to remain in situ until the end of his presidential 'mandate' in 2021. Removing Assad suddenly, however, could give Islamic State more room to expand its operations, and Syria could descend into further ethnic cleansing with Syrian Kurds, Shia and Sunnis permanently establishing their own regions of control. This would open up the possibility for the same to happen in Iraq and adversely impact the delicate domestic balance in other states, especially those which maintain a controversial relationship with a minority group(s). Secession in Syria might spark a new wave of unrest and civil wars as various groups become inspired to forge ahead with their own national liberation agendas. The option to remove Assad will continue to be dictated by events on the ground and whether a single Syrian politician will emerge from the carnage who can serve to coalesce international, factional, military and popular support for a national unity government. This is unlikely. The opposition is fractured and competitive, based on different ideological perspectives. The Syrian National Coalition (SNC) is inherently fragile, subservient to the interests of foreign powers that sustain it, as the resignation of Moaz al-Khatib, a Sunni cleric from Damascus, illustrated in 2013. One of the most complicating factors is that he or she would simultaneously need to trusted by Syrians, Iran (to maintain an Iranian corridor to Hizbollah in Lebanon) and the broader international community to maintain their respective security interests. Much depends on coordinating the actions of Turkey, Iran and Saudi Arabia and giving Syrians a voice in directing the future of the country, but with 4.7 million Syrians already displaced from a population of 22.8 million people (about 20 percent), the possibility for a truly democratic referendum on Syria's future looks to be increasingly remote. Reducing the humanitarian tragedy in Syria and its potential impact on the regional system is therefore set to be contingent on a common will to avoid further destruction of the state and facilitate a new credible political process.